Government Cloud adoption and Data Center Consolidation have pushed more and more critical services to the other end of the network line. This has put increased demand on networks to ensure secure, reliable, and agile connections for users. That’s why agencies are rethinking their Wide-Area Network (WAN) architectures to better adapt to this network demand. Software Defined Networking (SDN) serves as part of Next Generation WAN and is an ideal solution to this explosion in network demand. SD-WAN provides greater transparency and simplified measurement. 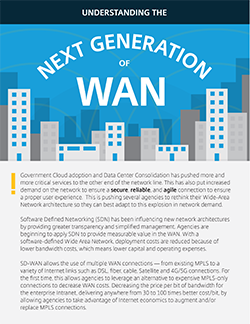 This infographic highlights the benefits of SD-WAN to your network, what agencies should do to prepare for Next Generation WAN, and why it’s important for government.